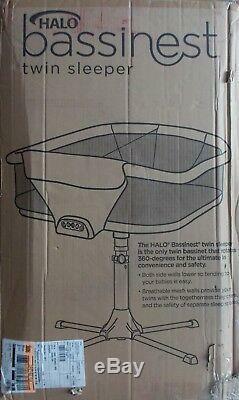 Halo Bassinest Twin Sleeper - Sand Circles. Brand New, Never Removed from Box. Description The HALO Twin Sleeper is the only twin bassinet that rotates 360-degrees for the ultimate in convenience and safety. Now your little ones can sleep as close as you like, while still safely in their own separate sleep areas, reducing the risks associated with bed-sharing. Its unique design means your twins are visible at your eye level, allowing you to soothe your babies quickly. Mesh walls offer maximum breathability: they provide your twins with the togetherness they crave, and the safety of separate sleep spaces. Its stable, adjustable base fits next to almost any bed. Recommended for babies up to five months of age or 20 lbs. The HALO Bassinest Twin Sleeper includes a soothing center with 3 soothing sounds, 3 lullabies, nightlight, 2 levels of vibration and nursing timer. 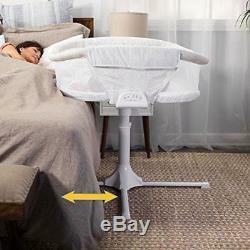 Rotates 360-degrees to bring twins to you for close, safe sleep. Both side walls lower so tending to babies is easy. Walls can be locked in the upright position, if desired. Ideal for mothers recovering from C-sections. Sturdy, stable 4-point base adjusts from 24" to 34" tall to fit most beds. Includes nightlight, 2 levels of vibration, 3 soothing sounds and 3 lullabies with volume control, all with 30-minute auto shutoff. Plus, nursing timer to remind you to put baby back to bed after feedings. Base easily tucks under bed and requires only 32 clearance from wall, making it ideal for small spaces. Includes two 100% polyester coordinated fitted sheets, two 100% cotton (white) fitted sheets, and two mattress pads Mattress is made from polyester that wipes clean with a damp cloth. Includes 2 storage pockets for baby's essentials. Requires 3 AA batteries - not included Mattress is waterproof and contains no toxic flame retardants. Independently tested to meet or exceed all U. Consumer Products Safety Commission and Health Canada safety standards for bassinets. Recommended for babies up to five months of age. Use should be discontinued when infant shows signs of pulling up, rolling over, pushing up to kneeling position. Safety Reminder: Never use soft bedding such as loose blankets, bumpers, pillows, and positioners in the Bassinest. The American Academy of pediatrics suggests the use of wearable blankets to keep your baby warm. We are a two person, husband/wife operation and take pride in providing more personalized customer service. 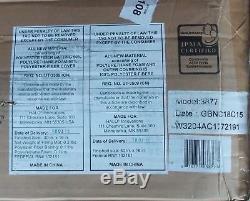 The items we sell are usually brand new in the box. Sometimes we sell displays, repackaged or new in open box items which this information will be included in our descriptions. If not paid, item will be relisted. Day and we will accept your request to cancel the order. Ships to lower 48 Continental US States only. The item "Halo Bassinest Bedside Twin Double Sleeper NEW Bassinet" is in sale since Tuesday, January 29, 2019. 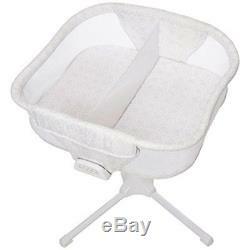 This item is in the category "Baby\Nursery Furniture\Bassinets & Cradles". The seller is "mrk186" and is located in Saint Paul, Minnesota. This item can be shipped to United States.